Pairing up can bring lots of benefits. Here’s what to keep in mind when looking for a match. Keep you accountable—you don’t want to leave someone waiting at the corner for a walk or at the fitness center for a workout. Boost your motivation—a cheerleader always helps. Make exercise time go more quickly—turning your workout time into social time makes it something you look forward to. Ready to buddy up? Here are five things that’ll help when looking for an exercise partner. 1. Same schedules. Half the battle shouldn’t be syncing your day planners. 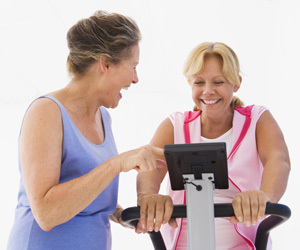 To make working out together easier, your exercise buddy should have a somewhat similar work or home schedule. Also, you want an exercise partner who won’t cancel at the last minute. Ask your potential partner these questions: Do you travel often? Do family or work commitments frequently call you away at the last minute? 2. Location, location, location. Just like that real estate saying, location matters when planning exercise with a friend. Who wants to waste time stuck in traffic when you should be exercising? One good rule of thumb: Travel time to workouts should be about half or less than the amount of time you’ll be exercising. Planning to walk for 30 minutes? Pick a place to meet your exercise buddy that’s no farther than 15 minutes away. Hopefully, you can find a partner no more than a few blocks away. But don’t limit yourself to those near your home. Perhaps you can find a partner who lives near a favorite coffee shop or work. 3. Like-minded goals. Similar goals ensure that you’ll be doing the same type of workouts and require the same time commitment and routine. And as you continue to exercise together, you’ll also progress at a similar pace, achieving milestones along the way and providing tips and encouragement. 4. Level starting point. Evaluate your potential workout buddies as far as fitness and commitment. Look for a workout partner who’s at the same fitness level as you. That way, one person isn’t left behind or feeling defeated after a workout. And an exercise partner who shares your motivation will ensure that you won’t skip workouts. 5. Clever other options. Even if you like to work out alone, or just can’t manage to pair up with someone on a regular basis, you can still tap into your social network to provide encouragement and motivation. You’ll be surprised at how many others out there are looking for the same kind of connection and fitness motivation! Remember to check in with your doctor before starting any new exercise.